At G & J Enterprises in Billings, MT we know wheelchair lifts. Unlike some of our competitors, they are not a sideline. Mobility is our specialty! Being true mobility specialists gives as huge advantage in both product availability and real experience. As your one stop shop for sales, installation, and service. We truly understand that one size does not fit everyone and our vast experience (we even have an RN consultant on staff!) in selling, installing, and servicing wheelchair lifts makes us clearly the best choice to help you make the right decisions about addressing your unique mobility needs and selecting the wheelchair lift that works best for your unique mobility needs. Century Series wheelchair lifts from BraunAbility are available in private or commercial models. These lifts offer a well balanced combination of dependable operation and economical design. The dual hydraulic lift arms on Braun Millennium Series wheelchair lifts give you the performance and durability you would expect from a BraunAbility wheelchair lift while the simplified electrical system and non-hydraulic spring operated roll stop make it every bit as safe while being more economical. Millenium Series wheelchair lifts from BraunAbility are also available in either private or commercial models. 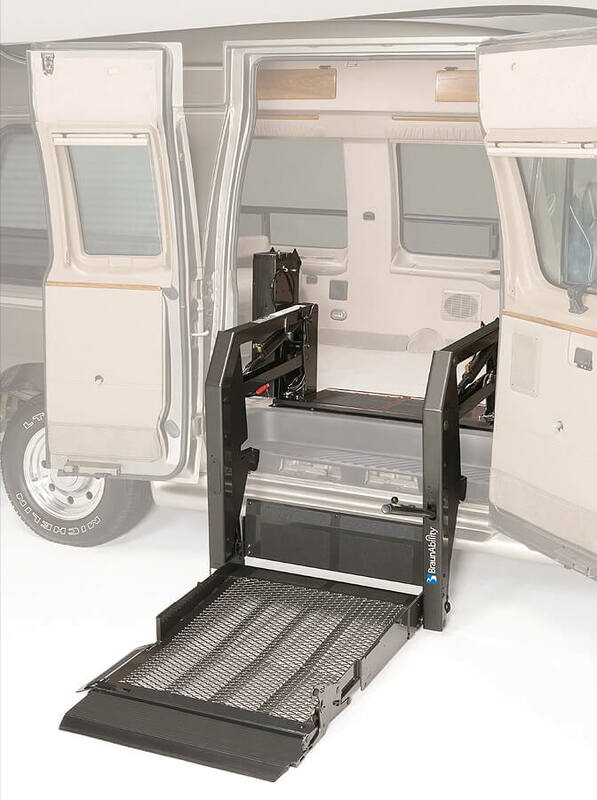 These wheelchair lifts are marketed as ‘the true workhorse’ of the BraunAbility line. Looking for a strong stable platform with years of time tested ability and endurance? Then you will truly appreciate these fine wheelchair lifts. A nice feature of the Millennium Series wheelchair lift is the standard side-entry design which allows easy wheelchair access even in tight parking situations. They also feature integrated platform lighting, color coded control switches, and a hydraulic automatic roll stop for added safety and convenience. Commercial wheelchair lifts for buses or larger vehicles have weight capacities of 800-1000lbs depending on which model is ordered. They are wider and longer than private use wheelchair lifts identified above. Some times an individual and their wheelchair fall into tye weight capacity and/or size requiring a commercial wheelchair lift. With a Ram Promaster or Ford Transit van, these lifts fit the best in the side door. The center row of seats is removed to make room for the individual in their wheelchair. Q’straint or Sure Loc tie downs are the brands we install to secure the wheelchair on all four points. They can be ordered in either manual or retractable wheelchair tie-down versions. EZ Lock is an electric wheelcair lock down system that allows you to drive from your wheelchair. A special bracket is installed on the bottom of your wheelchair and an EZ Lock base is mounted on the floor of your van. This locks your wheelchair in when you drive. A rigid seat belt connector for the shoulder strap will need to be placed in the tie down rails on the floor of the van. Choosing the right wheelchair lift, tie downs, or an EZ Lock can be overwhelming. Give us a call today and on of our friendly knowledgeable staff will help explain all of your options and models and help you make the right choice for a wheelchair lift and other equipment to fit your mobility needs.